Thespesia means "divinely decreed" and was given by Daniel Solander who saw it in Tahiti as a member of Captain Cook's ship. 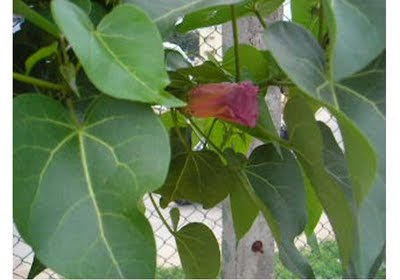 Indian tulip tree is an evergreen bushy tree. It grows to 40 ft or more with a spread of 10–20 ft. It has heart-shaped leaves and cup-shaped yellow flowers that are produced intermittently throughout the year in warm climates. Each flower has a maroon eye that ages to purple. The flowers are followed by apple-shaped fruit. Ground up bark is used to treat skin diseases (India), dysentery and haemorrhoids (Mauritius). Leaves are applied to inflamed and swollen joints (South India). When cut, the young fruit secretes a yellow sticky sap used to treat ringworm and other skin diseases (South India). Roots are used as a tonic. There is some modern investigation of the plant's effects on high blood pressure.